Take a walk along the Cedar Point Boardwalk and you can see the unforgettable red and white striped window coverings. You know exactly what that would be, a T.G.I. 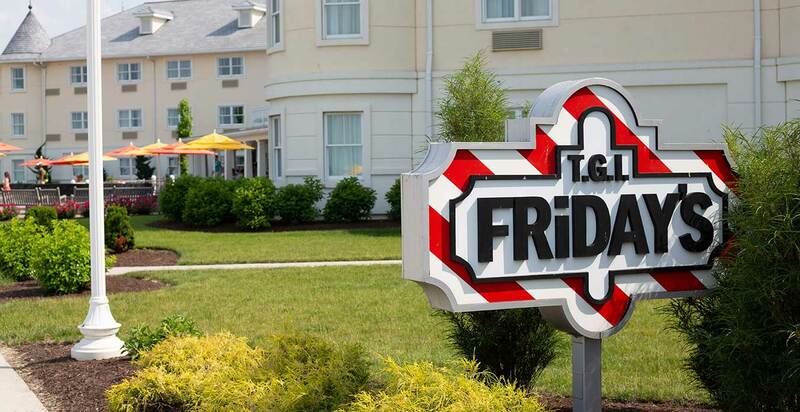 Friday’s® located right there in Hotel Breakers! You were just thinking of juicy burgers topped with melted cheese, hickory-smoked bacon, lettuce, tomatoes, red onion, pickles and that delicious Friday’s sauce. It’s ok, our mouth is watering too. And now here you are, standing in front of the place where you can order it. It was fate. But wait, now you’re thinking about the famous loaded potato skins with cheddar and bacon. That can be the starter to what is could be the perfect meal. The only thing that could make it better is a view. Oh wait, you can’t beat this setting - the restaurant overlooks the beach and Lake Erie.